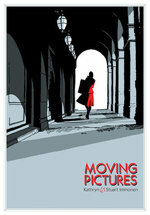 News | BOOKLIST loves MOVING PICTURES! Advance praise is starting to roll in for Kathryn & Stuart Immonen's gripping drama of Nazi occupation, art smuggling, and impossible choices, Moving Pictures! Booklist reviewer Francisca Goldsmith awards it a starred review: "This elegant and evocative historical graphic novel explores the personal relationships involved in protecting internationally recognized works of fine art during the Nazi occupation of Paris ... the storytelling and the characters are as sober as the crisp, heavy black-and-white of its images ... Deftly told, the whole story resonates long after its appropriately ambiguous final pages." The full review will run in the May 1 issue of Booklist. For more info on Moving Pictures or to pre-order the book, click below!